I guess I’m just much too performance driven (or seriously ADHD) to tolerate much in the way of conventional (read, bodybuilding-like), direct arm training in my overall regimen. Not that I have anything at all against the body building scene, mind you (to each his own) — it’s just not my scene. Enter my spin on EDT — Escalating Density Training. Whereas the idea of incorporating the total amount of work done in a particular exercise per unit of time as a measurement of progression has been around since before I was a kid bumbling around in the gym, Charles Staley was the first, to the best of my knowledge, to name and formalize the idea into a comprehensive training program. And as far as providing an easy-to-understand set of analytics to chase, you could do a lot worse than EDT. But, as always, we need to make sure the methodology we choose matches our goals. Is EDT the correct tool to use for increasing your 1 RM? Is it comparable with heavy, compound movements? The answer on both counts is, of course, no. Is it, however, a pretty good method to use with assistance work? To use in a higher-volume/lower-intensity mass-gain block? You bet. And for good ol’ direct bi and tri work, it’s my go-to template. In the clip below, I take my fellow Efficient Exercise trainer, Lesley O’Neal, through a truncated, 10-minute EDT bi and tri variation during one of our “train the trainer” gatherings. I explain in the clip how I determine when weight needs to be added to the bar for the various exercises. Essentially, it all comes down to “what can be done to increase the per-exercise work output”. With a given exercise pairing (and, assuming a consistent exercise rep tempo), we can either nail more repetitions in a given time period, or increase the weight on the bar. Simple enough. The real juggle begins, though, when the weight is increased sufficiently to actually reduce (via less accumulated total reps) the overall work output of the exercise. As far as we’re concerned, here load x distance (reps) = work. And what we’re attempting to increase is work output per fixed unit of time. Simple as that. Fitocracy; is it for You? I’ve been test-driving the Fitocracy site for the last few weeks, after having been clued-into it by clients of mine. I haven’t thought much about workout tracking services like this for myself, but after hearing rave reviews from a couple of my clients, I decided to check it out. And I have to say that I rather like it. Motivation, sense of community, accountability — these are all aspects of the psychological game that keeps people involved in health related pursuits. And Fitocracy is great for this. Is there much here for the advanced trainee? Well, maybe not. I do find it difficult at times to record some of my workouts (both in exercise selection and modality) — For instance, there’s no way for me (or my clients, for that matter) to log ARXFit work, or barbell/dumbbell complexes. But really, an advanced trainee is probably beyond the kind of motivation incentive offered by this type of community anyway. Nothing says that Fitcoracy can’t morph so as to include this demographic, though, and in time I think that they will. At any rate, though, I think that Fitocracy is at least worth a look. It won’t cost you anything to try it on for size. I’ve been pretty good about tracking my workouts there over the past couple of weeks, so you can follow the link about and check out what I’ve been up to. I have seen this type of training applied to gymnastics type compound movements. Although they are “heavy” they are more “compound” than isolation bodybuilding exercises. Every time I came back to the workout I had to beat myself by at least one round (the workout would finish with defined sets of the transition between chin/dip). Built a huge amount of work capacity in that groove and within a few more cycle was able to rep out 9 strict muscle ups. Love the content you put up here! Right on. Another good slant on the same idea. And hey, thanks for the kind words! I just tried this out, same pattern as you did. Clearly my triceps are stronger than my biceps! I did 8,000 lbs for fat bar skull crushers and 5,520 for fat ez curl bar curls. Arms feel great today. I’m looking forward to using a similar scheme with clients who have the arm pump bug. Thanks! Excellent! And yes, tris will, for most, be the stronger muscle group of the two. Agreed, that’s why I was surprised that for your workout, the workload numbers are nearly the same for both bis and tris. I fully expected mine to be way more triceps dominant. Both explanations are plausible! I was doing a pretty short stroke tricep movement, a dead stop floor skull crusher (bumper plates stop bar at forehead) and my curl was full ROM, strict. Next week I will go with 2 inches more ROM on the skull crusher (lay on mats) and bump weight to 85 lbs for both (as opposed to 80 which was a touch light). I was doing sets of 10 on the triceps and 8 on the biceps too. We will see if increased ROM changes things. Right on. Keep us in the loop on your progress! Eesh, between this and some new atlas stones, my biceps have been sore for days! 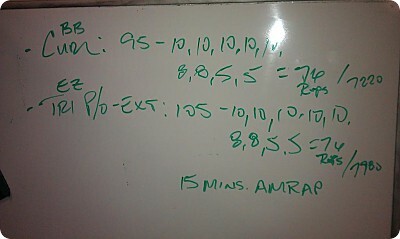 The the use of EDT in compound movements, in my mind, is akin to employing high-rep Oly derivatives within a routine. Metabolic fatigue results in (eventual) shoddy form, and so highly form-sensitive movements should not be performed in a metabolically-fatigued state. No bad exercises, just bad programming. There is, of course, an n=1 sliding scale, here. The fact that I can pull-off relatively heavy squat cleans within an OTM (on the minute) routine does not imply that everyone ought to do the same. Hardly. I’ve been doing this move for 30+ years, and can just about do them in my sleep. I know precisely when my form is off by even an iota. Ergo, I know when I need to pull the plug. And really, this idea applies to other disciplines as well. Sprinting should be done prior to “conditioning” within a session. My baseball players *never* took BP (batting practice) in a fatigued state. If you look at the exercises that I choose to employ in one of my HIIRT sessions, they are all low-skill/low risk movements. So yes, I’ll tend to pair primarily “isolation” or low-skill exercises with an EDT modality. Bodyweight exercises (in lieu of weighted compound movements) are a good choice as well.